A fine wale corduroy shirt ready for casual Friday's or just hanging out with friends. 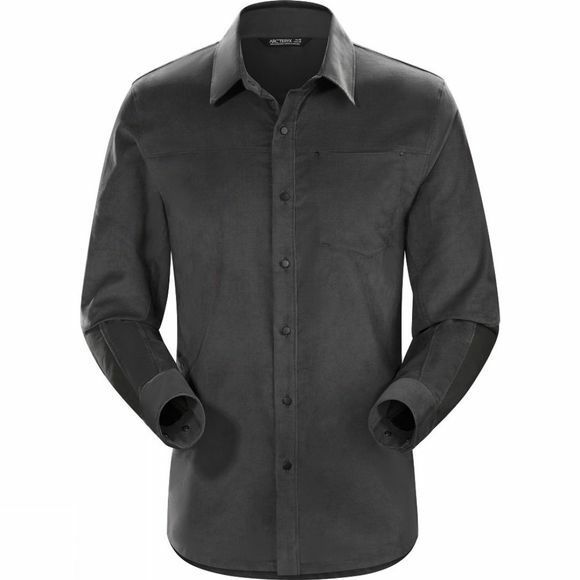 The Men's Merlon Long Sleeve Shirt can be worn both as a shirt or a light jacket. It integrates two discreet hand pockets, one pocket even has a media port through which to pass your favorite headphones. Infused with the Arc'teryx commitment to function and freedom, the Merlon has articulated sleeves and gusseted underarms for freedom of motion, and twines elastane into the weave for stretch. Burly cotton-nylon canvas reinforcements protect the forearms and collar, and the chest pocket has subtle stitch-through detailing. The corduroy combines cotton's comfort and breathability with the durability and moisture transport properties of polyester making this a highly functional shirt for the human powered commute.